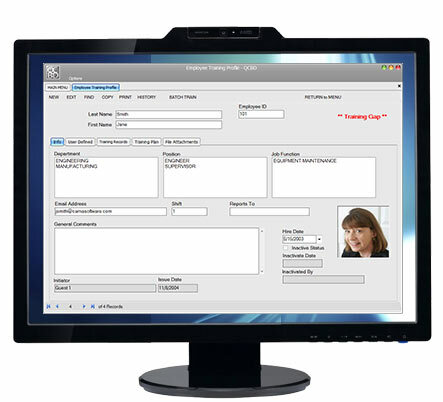 The Training Records Management module manages training records for all your employees. Define the employee training requirements, create training matrices and deliver training content specific to your organization. Track training requirements for each employee. Run reports to determine what training has been completed and what training is still due. Designed specifically to meet all the documentation requirements for your training system as described by quality standards such as ISO 9001, ISO 13485, AS9100, TS 16949 and SQF 2000 / ISO 22000. AUTOMATIC EMAIL NOTIFICATION – Automatically notify users by email when training is due. All records, reports and notifications can be distributed by email from inside QCBD. DASHBOARD VIEW – Users can view and respond to all required training action items with the click of a mouse. TRAINING MATRIX – Organize training to suit the function and operational structure of your company by building Training Matrices. Identify exactly who gets what training by organizing employees by department, position and job function. TRAINING RECORDS – Keep detailed training records for each employee. Attach documents, certificates or any type of training record. PLAN YOUR TRAINING – Plan Ahead. Use reports to show what training is planned and what training is due (or overdue). TRAINING CONTENT – Manage, control and deliver training content. Training materials (PowerPoint slides, Word documents, video files, etc.) can be added to training definitions. LINK TRAINING – Integrate training with the rest of your quality system. Training Records can be linked to other QCBD modules such as Document Control, Equipment Management, Nonconforming Material and Corrective Actions. When documents change, affected users can be notified automatically by email that training is required. USER ASSIGNED SECURITY – Assign access to each user separately, from the lowest read-only privilege to highest full supervisor rights. Users can be given access to view their personal training records. POWERFUL REPORTING CAPABILITY – Run reports such as training overdue and training that will become due. Training Reports can be the basis for establishing training effectiveness and employee competence. Data can be exported to Microsoft Excel®, providing unlimited flexibility. Use the Advanced Training Analysis report to get a complete view of your entire training program. When it’s time for management review (or during an audit), report your training with the click of a mouse.